Full of sharp personality and icy wit, Seth's plump penguin is bound to waddle into the hearts of both kids and grownups alike. Let this upright Antarctic bird add character to playrooms, nurseries, and hallways, or introduce this discerning bird to Seth Anderson's other, quirky creatures to create a personalized sanctuary. All prints are fine art giclee prints, printed and framed in Oregon. The original drawing was drawn with pen and pencil on paper. Made in the USA. printed and framed in oregon, also available unframed. I was able to use the entire Seth Anderson collecion in my Dining Room and all of the pictures are so adorable. The collection works well together and is a lot less expensive than other framed artwork. This lot is so cleaver. 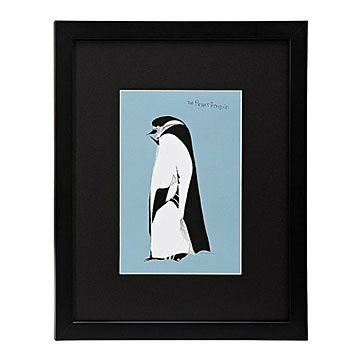 The Proper Penguin is just one of the nices pieces.